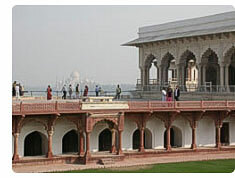 This structure was originally made out of wood but was later constructed in the present form by Shah Jahan. The throne room bears a clear influence of Shah Jahan style with the inlaid carvings and panels of marble with floral motifs. This hall of public hearing is the place where the Emperor heard the petitions of the public and met the officials. The hall of public hearing gives way to the Nagina Mosque and the Ladies bazar where only ladies merchants were allowed to sell items to the Moghal ladies. 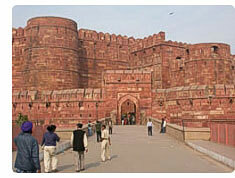 This was built by Akbar for his favorite son Jehangir to provide him with the comfort and luxury inside the fort. Just above the Sheesh Mahal is situated the Mina Masjid, which is believed to be constructed by Shahjahan for strictly private use. The Mina Masjid is enclosed on all the four sides by high walls. The marble mosque has three small arches in its facade, which are plain and unadorned. 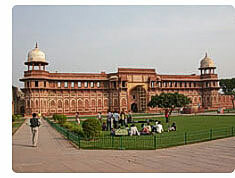 Moti Masjid is situated to the right of Diwan-E-Aam of the Agra Fort. One can see the domes of the Moti Masjid, which is the prettiest of all the buildings at Agra Fort. 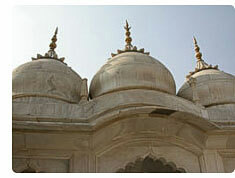 Moti Masjid is a white marble structure built by Shahjahan for his family members and court chiefs. Moti Masjid made out of white marble is one of the ancient mosques situated in Agra. It used to shine like a pearl once upon a time and hence the name. Opposite to the Diwan-E-Khas is the machhi bhawan, the fish enclosure. The emperor sat on the white marble platform facing the enclosure. 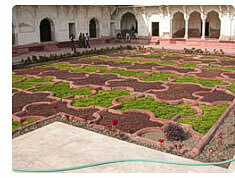 It once contained pools and marble fountains, which were carried off by the Jat Raja Suraj Mal to his palace at Deeg. 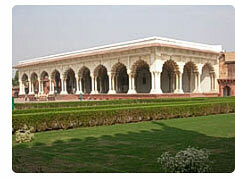 Opposite to the Mussaman Burj and just below the Diwan-E- Khas hall is the Sheesh Mahal or the glass palace. It is believed to to have been the harem dressing room and its walls are inlaid with tiny mirrors, which are the best specimens of glass mosaic decoration in India. 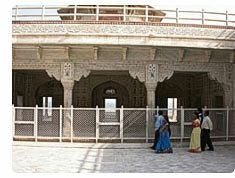 This is the first notable building inside the Agra Fort. 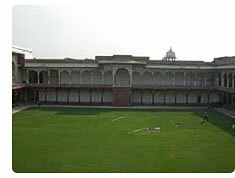 It was built by Akbar as women's quarters and is the only building that survives among his or9iginall palace buildings. It si built of stone and is simply decorated in the exterior. This elegant, double storeyed building reflects a strong hindu influence with protruding balconies and domed chhatris. The curved chala roofs of the small pavilions by the Khaas Mahal are based on the roof shape of Bengali village huts constructed out of curved bamboo, designed to keep off heavy rains. 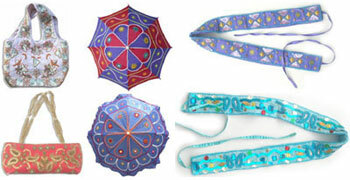 The shape was first expressed in stone by the sultans of Bengal. 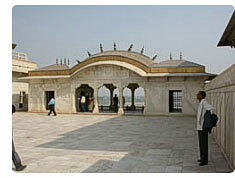 Theses pavilions are tradtionally associated with shahjahan's daughters: Roshnara and Jahannara Begum. 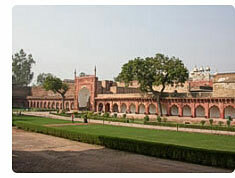 On the left of the Khaas Mahal is the Musamman Burj built by Shahjahan. It is a beautiful octagonal tower with an open pavilion. With its openness, elevation and the benefit of cool evening breezees flowing in off the Yamuna River, this could be well have been used also as the emperor's bedroom. This is where Shah Jahan lay on his death bed, gazing at Taj Mahal. No entry fee for children below the age of 15 years, both Indian & Foreigner.